If you have a blog and start to use FeedBurner to manage your feed, you have to change the autodiscovery link in your template and redirect the old feed to FeedBurner, so you don't have to tell your readers to subscribe to the new feed. Until today, there wasn't option to redirect the feed in Blogger, but now you can simply go to Settings > Site Feed > Post Feed Redirect URL and add the address of your FeedBurner feed. ... but Blogger only remembered about the first one. The other three don't redirect to the new feed, which is pretty strange, considering that the feed #3 is new Blogger's default feed. FeedBurner's blog notes that "by redirecting your feed, you can get a true picture of how many subscribers you have. Some of you might even see a few more subscribers magically appear, though results will most certainly vary." Even if Blogger mostly introduced this feature for FeedBurner, you can redirect your feed to any other address (for example, to a feed that mixes posts from all of your blogs). Last week, FeedBurner started to offer its premium services for free and it's pretty clear that, unlike other Google acquisitions, FeedBurner really moves fast. I tried it. It didn't redirect the #2. For #4, if #3 is at work, it won't redirect, and vice versa. Now, my own feed which is subscribed with the Blogger original feed link is no longer updating in Google Reader. The FeedBurner feed is updating though. some of the readers may find it weird that the feed stops updating !!! Which feed stopped updating? All of them seem to be OK. I subscribed myself both this feed and the FeedBurner feed. The latter continued updating while the former didn't update (I tried too many refreshes in vain). It must be a Google Reader issue. Some feeds are updated faster than others. rss.xml doesnt redirect while atom does. Btw, does adding ?orderby=published work for rss.xml too ? All the feeds are now sorted by the published date (and not by the last update, like they use to be), so you don't have to add that parameter. Sorry - just found it! Good times. Who in standard development do we need to talk to?? "If the feed is hosted in your own server, you should do the redirection yourself." When i subscibe my feedburner to live bookmark, the new post not show at top/first. can anyone help me, pls. can you give me a sample of this feed of this blog that you entered in feedburner? FeedBurner checks your feed every 30 minutes to see if there's a new post. So you need to wait a little or speed up the process by sending a ping. Great! Thanks for the info! but sorry, how to make the feeds has sorted by the new post in the top on "live bookmark". my own feed on live bookmark are not sorted by new post, this appear at the bottom. 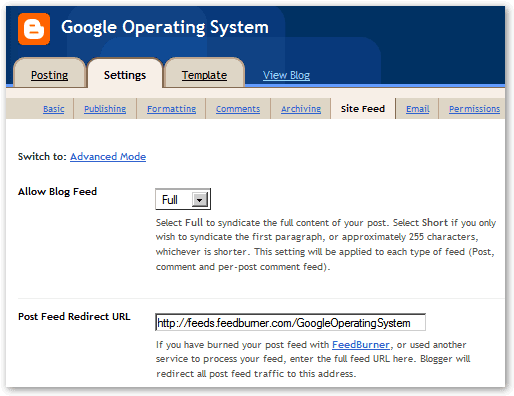 can you give me a sample the feed of this blog that you entered in feedburner? i want to follow with you to make my feed. thanks for your help. "All the feeds are now sorted by the published date (and not by the last update, like they use to be), so you don't have to add that parameter." I find that my feed list is sort not by latest post date. why? Help! I am in my feed settings but I am missing the field that says "Post Feed Redirect URL". Instead I have a field for "Post Feed Footer" as well as separate fields above that for Site Feed URL, Site Feed Filename, Site Feed Path, and Allow Blog Feeds -- unlike the screenshot. Is all of this because my blog (http://www.futilityinfielder.com/blog/blog.shtml) isn't hosted at blogspot? This is not a easy process for those who do not uderstand much about this. I am totally confused and had deletd my adsence setting...because I do not know what to and where to do ? What change and where to change ? seems to be showing up in the Feedburner feed even after pinging. I rarely update Blogger blogs but some should be recent enough to appear. I kept playing around in Feedburner and didn't even think about checking my settings in Blogger! I posted a link to this post for my readers too. Excellent post!!! It is My First Time Visit I Here. digital marketing training Course 100% Practicle Training.